An AVTECH 7.5m combined temperature and relative humidity sensor designed for indoor use. The sensor is able to measure temperature in the range of -55 to 125 °C with an accuracy of ± 0.125 degrees and relative humidity with a range of 5 - 95% with an accuracy of ±3.5%. 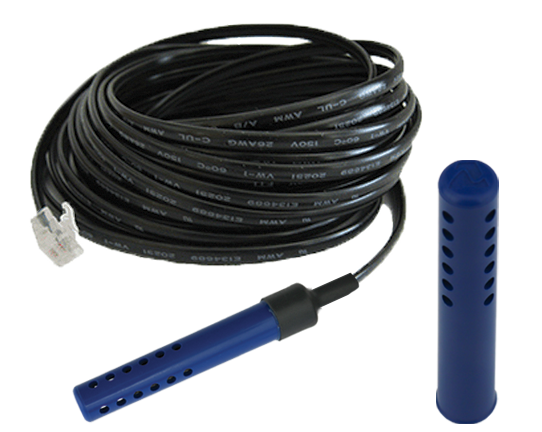 The AVTECH 7.5m Digital Temperature / Humidity Sensor is an auto-sense combined temperature and relative humidity sensor. The temperature range is -55 to 125°C / -67 to 257°F with an accuracy of ± 0.125 degrees. The relative humidity range is 5 - 95% with an accuracy of ± 3.5%. The AVTECH digital temperature sensor is a plug 'n play sensor that is automatically detected by the AVTECH Room Alert monitoring unit when it is plugged into one of the RJ11 sensor ports. Purchasing a combined temperature and relative humidity sensor will enable the heat index functionality built into your Room Alert. The heat index is a measure of the feels like temperature taking into account not only the temperature but also the relative humidity. A given temperature with a high humidity will likely feel more uncomfortable than the same temperature with a lower humidity. The Digital Temperature Sensor is available in lengths of 7.5m, 15m and 30m. A comparison of all of the temperature sensors available for your AVTECH Room Alert monitor. AVTECH Announce Next Generation Temperature & Humidity Sensor AVTECH have just introduced a next generation Digital Temperature & Humidity Sensor, with a newly redesigned and improved enclosure cap. The newly designed sensor started shipping 7.5m length orders on 7th December 2018. Longer length sensors will follow in the new year. AVTECH Software - Buy One Temp & Humidity Sensor, And Get One FREE In November! 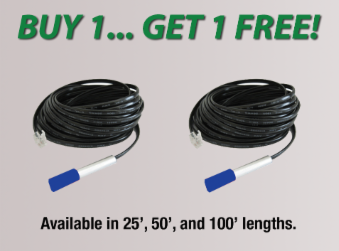 Customers who purchase any size cable length Digital Temperature & Humidity Sensor in the month of November will receive a second one absolutely free!